Patrick Arsenault, Regulated Canadian Immigration Consultant (RCIC) works with foreign nationals and permanent residents to address immigration-related legal issues and concerns. Ghost/Fake Immigration Consultants: Be Careful! Regulated Canadian Immigration Consultants (RCICs) are experts of Canadian immigration laws, regulations, and procedures. Working with an RCIC can greatly facilitate your immigration process to Canada. However, it is imperative that you check that your consultant is regulated and in good standing with ICCRC. Otherwise, they are not allowed to charge a fee to assist you in your immigration process. A number of fraudulent individuals have been reaching out to prospective immigrants pretending to be RCICs. They portray immigrating to Canada as an easy process with little to no requirements if you hire the right people. That is simply not true. I am aware of at least five people who have been approached by fake consultants that were using my name and my picture on WhattsApp to provide fake advise, putting individuals and families in jeopardy. I would recommend to ONLY communicate with consultants using the contact information listed on the ICCRC website and avoid using social media and WhattsApp as it is easy to steal someone's identity. Make sure you report ghost consultants and identity thefts! If someone contacts you pretending to be me, please let me know and contacts ICCRC as soon as possible. You should contacts ICCRC any time you are contacted by a Canadian immigration consultant that is not licensed. Oh, and that's not me and these documents are FAKE/FRAUD! As you work on your "Canadian Dream", you must ensure you are working with top experts that are regulated and legally allowed to assist you. The risk of fraud is high and many individuals are out there trying to take advantage of immigrants. MAKE SURE you only use the email address listed on ICCRC to deal with your consultant. DO NOT engage with strangers on WhattsAPP or other social media that are saying they can help you immigrate to Canada. They may try to steal your money. Like many other consultants, other people try to impersonate me on a regular basis. Here are few examples from the many I have been sending to the authorities over the past few months. LinkedIn recently produced a list of the most sought after employers in Canada by looking at four key metrics: interest in the company, engagement with employees, job demand and employee retention. These employers are not necessarily Canada's best employers, but they are employers that generate the most interest from Canadian job seekers. How Much Can you Expect to Make in Canada? There are many factors to consider when deciding whether to relocate to Canada or not. Immigrating to a new country is a big commitment and it required a significant monetary investment from purchasing flights, buying new furniture, paying the legal fees, possibly retaining a Regulated Canadian Immigration Consultant, etc. Most prospective immigrants are curious to know how much they can expect to earn once in Canada. Although it is impossible to know for sure, there is some data that can be useful in making predictions. In Canada, each province or territory has a legal minimum wage. That is the hourly wage under which it is illegal for employers to pay you. This means that you can count on being paid at least the following wages for any job in Canada. It can also be useful to look at the annual average salaries for each province. As a whole, the average salary in Canada is around $51,000 and the GDP per capita is USD $48,300, which is essentially the amount of money generated in Canada divided by the number of inhabitants. Canada currently ranks in the world's top 35, well before many other developed countries such as Belgium, United Kingdom, Japan, France, Finland, the European Union as a whole, South Korea, Italy, Spain, Portugal, New Zealand, and many more. Canadians are generally heavily taxed in order to fund world-class universally available services such as health care and education. On average, Canadians spend more on taxes than they do on basic necessities such as housing. In fact, a typical Canadian family will pay 42.5% of their income to the government. This may be something you are not used to and that you must account for when budgeting. Unlike many other countries, Canada does not include the sales tax to prices displayed in stores. As such, shoppers have to add between 5% and 15% to the cost of most items they purchase, depending on where they live. You can estimate your after-tax income online. It's impossible to truly know how much one individual will pay in taxes without more information. There are a long list of tax deductible expenses and tax credits available to help you reduce the amount of tax you will owe at the end of the year. Fortunately, most employers will automatically take money off your pay-check so you only need to make minor adjustments at the end of the year to either pay a little more or claim a refund if you overpaid. The cost of living in Canada is very reasonable. Only one Canadian city made it to the top 30 of the world's most expensive city and only another city made the top 100. In Canada, professional occupations are attribued NOCs (National Occupational Classification). Once you know what your NOC is, you can look at job prospects and salary expectations by towns, cities, regions, and provinces. It's easier to think that immigrants are never welcome in most developed countries by watching the news. While it is impossible to find a perfect society where no one is racist, it can still be interesting to look at data about the opinion of citizens on immigrants. In 2019, the Pew Research Center produced a comprehensive study where they surveyed countries that held half of the world's migrants from the United States (18%) to Hungary (less than 1%). The results show that Canada is the clear place in the world where the population sees immigrants less as a burden to society, but rather as a strength. 68% of Canadians consider that immigrants make the country stronger. Interestingly enough, Canadians am ambivalent when asked if they believe that immigrants want to either adopt Canadian customs or way of life (48%) or prefer to remain distinct from the Canadian society (47%). On the other hand, there are countries that are a little more extreme. For instance, Japanese expect that newcomers want to adopt the Japanese lifestyle (75%) and only 10% of Italians believe that newcomers want to adopt the Italian way of life. Why is the Atlantic Immigration Pilot Program (AIPP) so Popular? The Atlantic Immigration Pilot Program (AIPP) is an immigration pathway that is run as a pilot program until November 2019. Currently, it is one of Canada's most popular immigration pathway. The Atlantic Immigration Pilot Program is one of the quickest ways to get permanent residency. In fact, foreign nationals can become Canadian permanent residents in about six months. Immigrants value being able to get permanent residency quickly, because they want to avoid uncertainty as much as possible by not having their immigration status tied to one specific employer. Another facet of the AIPP program that makes it that popular is the fact that workers can obtain a temporary work permit, so they can start working while the permanent residency is being processed. Not every employer will be able to wait six months or more for candidates to move to Canada. Having the option to come work in Canada while the process takes place is certainly appealing. One of the mechanisms in place to protect the Canadian labour market are Labour Market Impact Assessments (LMIA). When an employer is not able to hire a Canadian worker, they have to go through a complex process where they have to determine what the impact of hiring a foreigner would be on the Canadian workforce. Essentially, the process aims to verify that the position cannot be filled by a Canadian. If the LMIA is positive, the employer will be issued a confirmation that he is allowed to recruit internationally. Many employers prefer not to go through this complex process. This is waived in the AIPP program. In that program, employers become designated by an Atlantic province: New Brunswick, Prince Edward Island, Nova Scotia, or Newfoundland and Labrador. Once they are designated, they only have to advertise for positions for six weeks. If they could not find a Canadian worker, they are then allowed to hire a foreign national without getting a LMIA. When employers use the AIPP program, they have to work with an approved third party organization to create a settlement plan for the newcomer and their families. Immigrants are fond of this, because it requires employers to be fully committed to them. They have to help in the resettlement program. This makes the relocation and integration processes a little easier. When immigrants apply for Express Entry, they sometimes retake their language test several times to try to score more points for language abilities. The way that AIPP is setup, candidates only need to reach CLB 4, which is lower than with most immigration pathways. AIPP is particularly popular right now, because the pilot program is only confirm until November 2019. There is no guarantee that this opportunity will still exist after that time. Hence, many immigrants are trying to file their application as soon as possible. Working with a Regulated Canadian Immigration Consultant could be helpful in order to ensure a prompt processing. Canada is a huge country. Living in one region or area can be very different than living somewhere else. Atlantic Canada is home to breathtaking scenery, easy access to the ocean (in many cases great beaches), and lobster, fish and seafood are abundant and fresh. It's a popular vacation destination and it is known to be a little more laid back, filled with the friendliest people you can meet, and a safe place to raise a family. The cost of living also tends to be lower than in most major population centres, making owning a house easier. Finally, with aging population, there will be a need for more workers in the future. Canada is the most educated country in the world with an average of 55% of working adults having attained some level of post-secondary education, while most other developed countries are closer to 35%. Canada has one of the best education systems in the world along with countries like Finland and South Korea. What is very interesting is that, for Canada, having more migrant students does not decrease overall performance like in other countries. It increases it. Canada is also different from most countries that perform well, because it does not have a centralized education system. Instead, each province is responsible for developing its own education system. Individually, they also perform extremely well on the global scale. If Canadian provinces entered Pisa tests as separate countries, three of them, Alberta, British Columbia and Quebec, would be in the top five places for science in the world, alongside Singapore and Japan and above the likes of Finland and Hong Kong. There is no point in getting a position based on a fake persona. It won’t be a good match; hence pointless and the interview will feel very uncomfortable (#TrueStory). Know about the department you’re applying for, as well as the organization, especially when it comes to organizational culture. Read about what they have been doing. Even if you don’t know all the details, awareness of their projects will go a long way. You can also reach out to people in your network that may have insider’s information (LinkedIn is a great tool for that). Smile and make sure to make eye-contact. Try not to cross your arms or legs. Don’t be afraid to ask them to clarify. Wearing the organization’s colors or mimicking their dress code and/or posture (discretely) is probably not a bad idea. I would say that this is the one time where you can be a little bit more vulnerable. Don’t sell yourself short, but be genuine. Send a handwritten thank you note/card.I personally like to give a postcard of my hometown when I interview out-of-town. People tend to hold on to them as decoration for their offices. I know I do! Do practice interviews and informational interviews. These are difficult to get, but I find that it is very helpful to explain your motivation behind seeking this interview (as opposed to simply asking for one). Using people in your network to interview you or connect you with key people is also a great strategy. Try to find a couple of funny/interesting stories that you can use in your interviews. You’ll stand out and they’ll remember you. For example, my friend’s elevator pitch starts with something like “The moment I realized this is what I wanted to do, I was in prison” (he was working there). Catch your interviewer off-guard. Just be a rock star. ​There is no one else better qualified than you… or that’s how you should act. Make sure you have the perfect Leil Lowndeshandshake (page 32: trick #8). Don’t talk about past supervisors or team members in a bad way. It just makes sense. You want to talk about your past experiences and relationships with your prior supervisors in a positive way. If you feel like you absolutely need to address some issues, pay attention to the next bullet point. When I interviewed at the University of Vermont, one of the managers gave me a one-pager.It was about her leadership style. That really made an impression on me. Later, I built my own on paper and ultimately online. Try to engage in an unusual way with your interviewer. Sometimes, I draw the project management triangle to explain what I would do in a situation where multiple deadlines need to be met. I think me bringing a little bit of theory and engaging with them by drawing it and explaining it increases my self-confidence and makes me stand out. When you are speaking remember the three truths: Product truth, Customer truth and Cultural truth. ​You want to make sure you address the organization’s problem from three perspectives. What can you bring to the table (product), what are THEY looking for (customer) and what is the industry like (cultural)? This is an excerpt from an article written by Patrick Arsenault in the NASPA Student Affairs Collective. It was one of the 5 most read articles of 2013. How Much will it Cost to Hire an Immigration Consultant? Hiring a Regulated Canadian Immigration Consultant is an important decision to make and there are several factors to consider; cost is certainly one of them. Of course, the cost professionals charge depends on several things, including years of experience, credentials, areas of expertise, size of the practice, location and operation costs, types of services offered, etc. In 2018, Canadian Lawyer Magazine conducted a survey of immigration lawyers in Canada and found that on average, they charged the following hourly rates. These rates are for lawyers, so expect the fees of Regulated Canadian Immigration Consultants to be around 20% to 25% less. That is mostly, because RCICs are specialists and not generalists. They solely focus on immigration, which means that they may not be able to assist in very complex immigration cases that involve other areas of the law such as criminal law. There are only 13 higher education institutions in the world that grant the credentials required to register as a Regulated Canadian Immigration Consultant. On the other hand, there are 21 law schools in Canada and thousands more around the world. In addition, many top Regulated Canadian Immigration Consultants hold additional degrees and credentials. They also are involved in various professional organizations where they contribute to regional, national, and international high-level conversations about immigration laws, regulations, and procedures. When assessing how much you are willing to pay for a Regulated Canadian Immigration Consultant, consider what kind and level of expertise you are looking for. 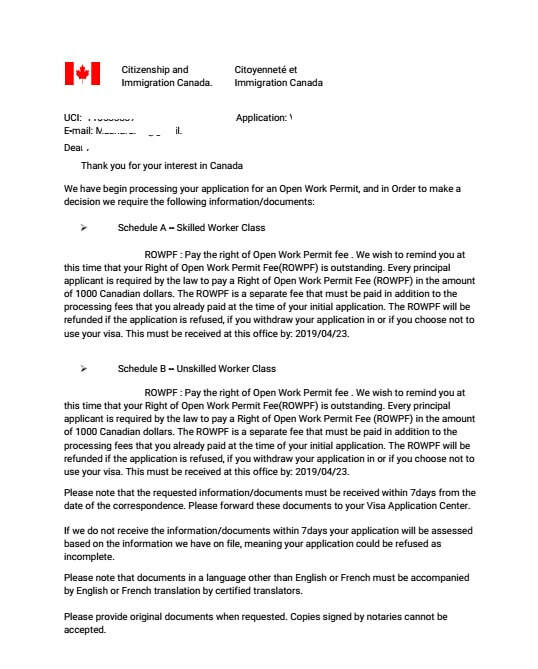 In the vast majority of cases, clients will opt to enter in a retainer agreement where they agree to pay a set amount for their immigration issue to be resolved or for their complete work permit application. In the long run, this is almost always cheaper than paying the going hourly rate. The all-inclusive prices can vary greatly. Two factors that have an impact on these prices are the type of services and the size of the immigration consulting practice. The 2018 Canadian Lawyer Magazine survey revealed the following. One important thing to keep in mind is that smaller offices, particularly independent consultants, sometimes have more latitude to adjust prices for services based on the individual needs of a specific client. Regulated Canadian Immigration Consultant are all authorized to practice everywhere in Canada except the province of Quebec, which requires an additional professional designation. That means that you can hire a Consultant based anywhere in Canada. It does not matter where you intend on settling. Based on the following table taken from the 2018 Canadian Lawyer Magazine survey, foreign nationals are often better off at looking for Regulated Canadian Immigration Consultants in either Ontario or Atlantic Canada (East). Beyond that, it is useful to consider where consultants are based. For example, a consultant in rural Ontario would be able to deliver more value for less than a consultant based downtown Toronto, because of operation costs. Regulated Canadian Immigration Consultants are all regulated by the same body and must respect the same code of conduct and meet the same requirements to be authorized to legally provide immigration advice and represent clients in immigration cases. However, the services offered can vary quite a bit. You may find a firm that charges $200 less than another, but the firm in question is actually only offering to review your documents or even only providing access to a "Do it Yourself" (DIY) Course. Foreign nationals have to understand what level of service to expect for the price they are paying. If the price you get quoted is not aligned with national minimums and averages as presented in this article, there is probably a good reason! There are many great reasons to hire a Regulated Canadian Immigration Consultant. Individuals interested in hiring an RCIC can find it difficult to determine how much they should be willing to pay for these services. I truly hope that this article containing real current data about the going rate of immigration professionals in Canada will help you determine what your budget should be, how to reduce the cost of an RCIC, and what questions to ask before making a final decision. Finally, many RCICs will provide prospective clients with a free short consultation. These free consultations can allow you to ask questions about the nature of services available, get to know the RCIC better, and learn about additional areas of practice that could be useful, such as educational counseling or career strategy. Canada is HUGE. It is actually the second largest country in the world after Russia. That means that there are many different places where you could choose to relocate in any of the 10 provinces or 3 territories. Money Sense recently ranked over 400 different cities and towns in terms of quality of life. See the full ranking online. RCICs are the legally authorized to provide immigration advice in Canada and are regulated by the ​The Immigration Consultants of Canada Regulatory Council. An RCIC can assess your chances of being able to successfully immigrate to Canada using various programs, coach you for VISA interviews, and guide you through all the steps to obtaining your travel documents. They can also represent you in many immigration related situations. The CCS is a Canadian standard for validating the expertise of career development professionals. The CCS certification was designed by Career Professionals of Canada and validated by an independent group of industry leaders in academia and providers of career services. The CCS supports provincial CCDP certification programs and upholds the principles provided in the Canadian Standards and Guidelines for Career Development Practitioners.